Author William Tate’s comprehensive column answers the questions many of us had regarding Scott McClellan’s treacherous book. Read Soros Publisher ‘Shaped’ McClellan’s Hit Job: Other publishers don’t recognize it as the same book. The answers to your questions will jump out from the page. Kudos to American Thinker for this well documented exposé. Technology has now given advertisers the ability to gather information about those looking at their billboards. Some new ad boards come equipped with tiny cameras that can gather details about passers-by—their gender, approximate age and even how long they looked at the billboard. The surveillance data is transmitted to a central database for marketing purposes. Keep your shades on and your eyes on the road. Twelve-year-old master speller, So-Young Iris Chung misspelled a word that took her out of the semi-finals in the national competition, but she nonetheless won our hearts. Who among us could spell “Chrysoprase,” much less know it’s meaning? The contest winner is Sameer Mishra, 13, of West Lafayette Indiana. He won $35,000 in cash and more than $5,000 in other prizes. 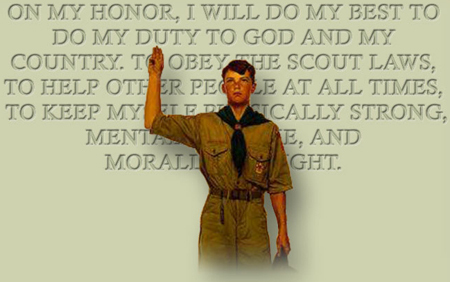 Robert Knight, writing for Townhall, has written a compelling piece titled, Media Shove Boy Scout story under a tent. We highly recommend it. Seeing Red AZ first covered Philadelphia’s appeasement of homosexual activists at the expense of the Boy Scouts of America in October of 2007. Not to make light of a serious situation, but why do those who attempt to hire a killer always manage to contact an undercover officer instead? It used to be Jack Ballentine, a now-retired Phoenix police officer who gained legendary status by playing a hit man for hire. In the role of that character he was instrumental in the 100 percent conviction rate of 24 would-be killers. “It’s surprising, there is a lot more (demand) than you would expect,” he said. “I did four or five a year over a 15-year period,” Ballentine was quoted as saying. Could they working to undermine him? Another radical racist takes the pulpit at Barack Obama’s Trinity United Church of Christ —but this one is a liberal extremist, White priest! Update: National Review’s The Corner carries the statement of Cardinal Francis George of the Archdiocese of Chicago, rebuking Father Michael Pfleger’s theatrical performance and ridicule of Sen. Hillary Clinton. It is available here. Former GOP Presidential candidate and U. S. Senator, Bob Dole has sent a scalding email to Scott McClellan, excoriating the former White House spokesman as a “miserable creature” who greedily betrayed his former patron for a fast buck. Jonathan Martin of Politico shares the message. You are currently browsing the Seeing Red AZ blog archives for May, 2008.